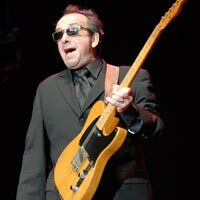 Elvis Costello’s Spike features quite a few political songs — including the capital punishment commentary of ‘Let Him Dangle’ and the anti-Thatcher ‘Tramp the Dirt Down’ — and the personal songs are pretty dark. Even ‘Veronica,’ the jaunty minor hit co-written with Paul McCartney, is about an elderly woman who has seen her identity stripped away while living out her final days in a nursing home. So while Costello is dressed as a clown on the album’s cover, he’s most decidedly a sad clown. But today’s song is a welcome exception. ‘Chewing Gum’ isn’t exactly a feel-good tune — it’s about the dysfunctional relationship between an obnoxious businessman and a “mail-order bride” (perhaps a literal one or maybe just a kept woman) — but musically it’s just giddy. The Dirty Dozen Brass Band are featured here again, to much different effect than in the elegantly somber ‘Deep Dark Truthful Mirror.’ Here they’re in full-on funk mode, whipping together something that wouldn’t feel out of place on a Prince album. This entry was posted in costello weekends and tagged Chewing Gum, Elvis Costello, Spike. In addition to being a flat out fun song, this is one that makes me just sit back and marvel at EC’s songwriting, arranging and performance. I mean, just listen to what is going on in this song! The dissonant notes and chords, the funky syncopated counter rhythm, with EC’s lyrics layered over the top to pull it all together. I spoke earlier when writing about “Human Hands” about EC’s ability to compose a song under the song. This is another instance, although with “Chewing Gum,” it’s as if he layered the parts upon each other and then twisted it a bit to give it that extra funk. Pure genius. Yes, I am very pleased with this pick, as it was one of those songs on mega repeat back in the day. I simply could not get enough of it. I have no idea what it’s about, or how many songs he’s writing or layering or whatever, I just know that it got under my skin like CRAZY. From a strictly musical perspective, this is probably one of my favorite songs of all times. Pity that I haven’t listened to it for years – and that I can’t listen to more than a 30 second My Space teaser now!! !